After my graduation, my parents and I went on a short trip to New York City, and then down to Atlantic City. 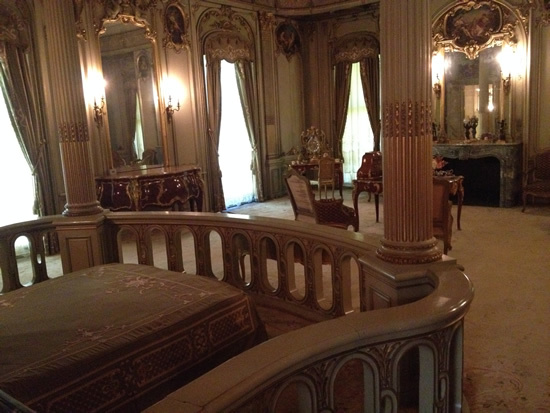 We took a little stop on the way to NYC and visited the Vanderbilt Mansion National Historic Site in Hyde Park. The Vanderbilts were one of the richest families during the Gilded Age and built a number of impressive mansions. The mansion in Hyde Park is actually one of their smaller mansions, and the tour guide even said that the Vanderbilts referred to it as a “cottage”. It’s certainly quite a big “cottage”, although it is a little smaller than the nearby Mills Mansion that I visited last summer. The interior of the mansion is of course luxuriously decorated, and the grounds surrounding the mansion is a great for a stroll or a picnic. The lobby of Metropolitan looks busy, but the museum is so big that there are a lot of rooms that are really quiet. 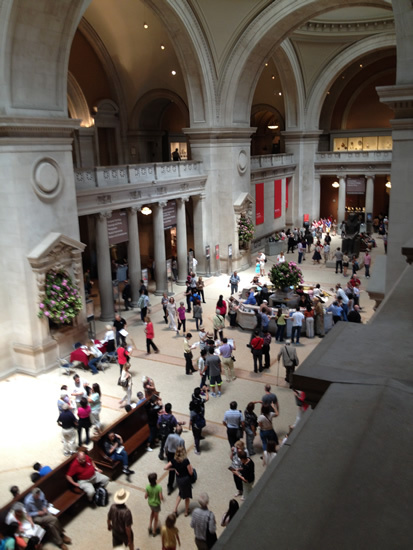 Our main attraction in NYC was to visit the Metropolitan Museum of Art in Central Park. Actually two years ago we wanted to visit, but the museum was closed and we went to the Museum of Modern Art instead. 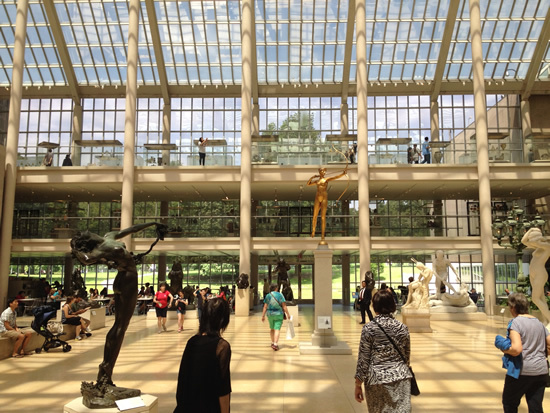 Situated on the east side of Central Park, the Metropolitan Museum is certainly worth the visit, even for those of us who are not into the arts. The museum is a huge, and it takes half a day to walk through all of the exhibits, and much longer to actually examine the exhibits carefully. I liked the variety of displays the Metropolitan had. There were some big, grand open rooms with larger items, and smaller rooms holding a few artworks. And of course there are items from a lot of different cultures and time periods. It was certainly a feast for the eyes. In addition to walking around the inside, we also went to the roof of the Metropolitan. It was a great day out, and we had a bright and clear view of Central Park and the skyline of the Manhattan Midtown. The Butler Library at Columbia. 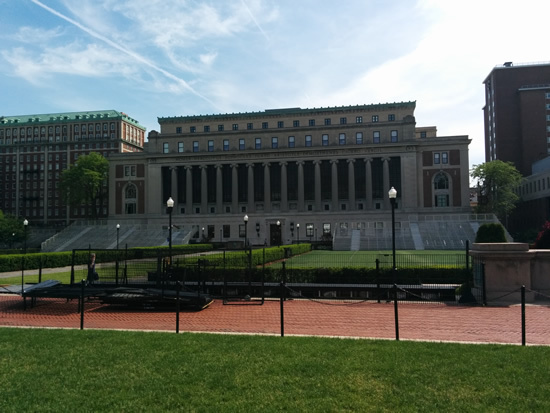 While in NYC, we also visited the campus Columbia University up in the northwestern part of Manhattan. It’s the fourth Ivy League campus I’ve been to, after Harvard, Brown and Cornell. Since it’s situated in Manhattan, Columbia U’s main campus is limited to about two blocks, but they make good use of the space and there is still a definite campus to see. Prestigious Ivy League schools tend to have some nice historical buildings, and Columbia is no exception. Being located inside of Manhattan also gives the school a different feel. After leaving NYC, we headed to the campus of another Ivy League university in Princeton University. Located in Princeton, NJ, Princeton U has a large campus. There also seems to be a lot of trees and cover, but maybe I felt that way because the sky was overcast. Princeton has some very impressive-building stone buildings, some of which that look like castles. 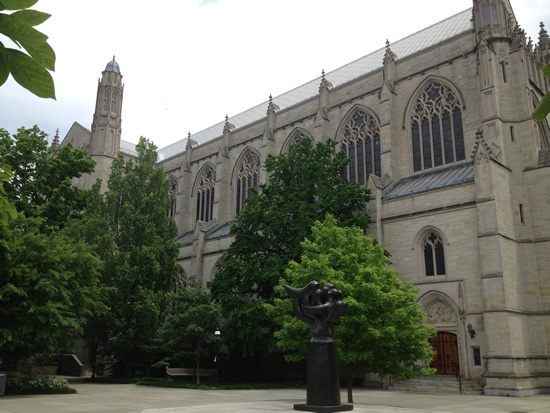 The largest and most impressive building on campus was the massive Gothic-style chapel that towers over the other nearby building. There is also an interesting installation of Chinese zodiac statues at the Scudder Plaza. Overall Princeton has quite a nice campus. Compared to other Ivy League schools I’ve visited, I still rank Cornell’s campus as my favorite though because of its vast open spaces and its location near Lake Cayuga, but Princeton definitely holds its own. 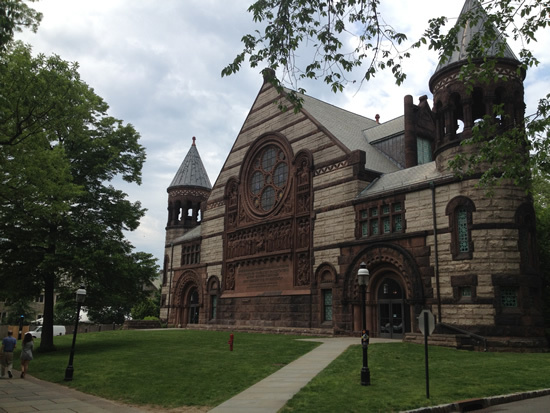 An example of the distinctive stone buildings in Princeton University. Once again walking the boardwalk at Atlantic City. The last stop on our trip was Atlantic City. I visited there less than two years ago, but my parents haven’t been there and the hotel was cheap because it’s the off-season, so we headed down there. My family isn’t too much into gambling, so we just donated five dollars to the slot machines and that was the extent of our gaming. It also wasn’t quite warm enough to be taking a dip in the Atlantic Ocean. 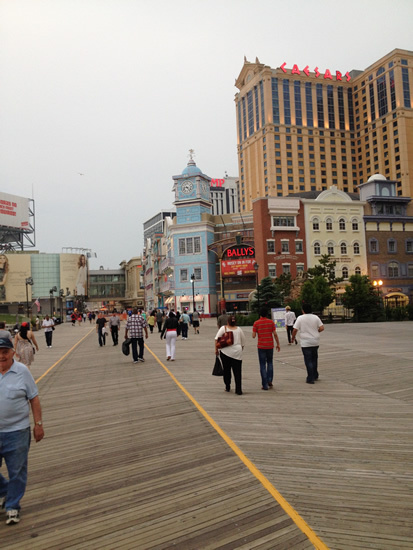 We did take a stroll on the famous boardwalk, and I realized that I missed a large section of the boardwalk the last time I was in AC. The area got hit pretty hard by Hurricane Sandy, but it looks like most of the damage have been repaired. Our outings ended when it started to rain at night, and that was the extent of our short visit this time.